Yes, I took the plunge. I’ve been loving Lush’s Feeling Younger highlighter but it is creamy and I knew it would make my skin too oily in the warmer months. I wanted to look for a powder highlighter that would be sheer, set my makeup and still make me look naturally glow-y without glitter. I was most interested in the Hourglass line so I took a look at all of them at Sephora, and did a lot of swatching. Then I tested Luminous Light on my face and was instantly in love. This does exactly what I want it to. It was a splurge but it really does feel like the missing piece in my makeup routine. It’s just gorgeous. 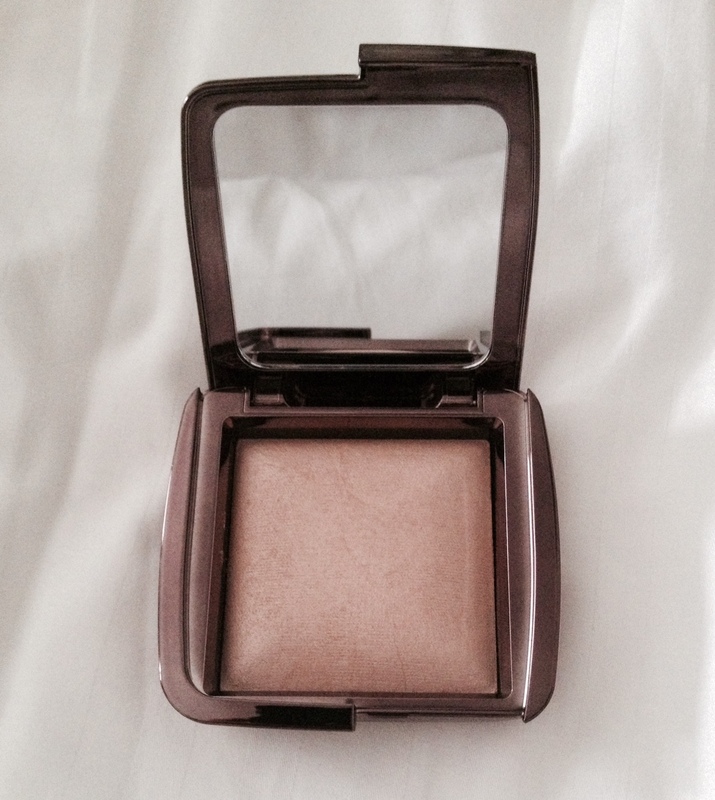 I’ve been looking for a powder blush in a neutral peachy shade with a small amount of shimmer and some staying power. After ending up with yet another drugstore one that I hated, I started looking into higher end brands, knowing I had a Sephora stop coming up. First on my list to check out were Tarte and Nars and I wasn’t impressed with either. Every tester I saw had a hard layer on top and it seemed like it would be hard to get product onto the brush. I happened to glance down in one of the aisles and saw the prettiest peach shade in the Kat Von D line, which I had never seen before. I swiped my finger on the pan of Bellisima and I was sold. The formula is so soft and really pigmented. The color was also exactly what I was looking for and the staying power is awesome. I’m starting to realize that by the time I cheap out on three crappy $8 blushes that don’t work I might as well just invest in a good quality one and be done. Lesson learned. For a year now I’ve been using Anastasia’s Brow Powder and clear gel. My brows are easily the most complicated part of my makeup routine and while that’s fine for a night out, I was tired of brushing on powder until both brows were even, wiping away the excess that fell around my brows and then gelling them down. I decided to test Gimme Brow to save some time in the morning and I’m so impressed with it. It’s so easy to use and makes my brows look natural and full without being crunchy. The lightest color is perfect for me too. I highly, highly recommend this. I’ve already pressured my sister into picking one up and she likes it too! I usually buy only Karma bath bombs at Lush but this one smells like vanilla ice cream and claims to be super moisturizing so I decided to give it a try. As soon as it hits the water it starts to fizz, exposing little chunks of cocoa butter that melt into the water for the most moisturizing soak ever. My skin was so moisturized after that I didn’t even need lotion. I love this and only wish I had bought more of them. Do you have any new faves? Do tell!